Thanks to Bojana for the link to a strange waiver on the website of the town of Perth, Ontario, Canada. It's not as ridiculous as the waiver required for a quiet bike ride in Chicago, as mentioned in the Go Green, Go Dutch, Go Die post, but what makes it odd is that you have to sign it before downloading... cycling maps. This cycling map has been developed to assist in planning bicycle trips throughout the County of Lanark. Users of this cycling map are responsible for their own safety and use these routes at their own risk. Users should consider not only route conditions but also their level of experience, comfort level riding in traffic, traffic conditions and traffic volume, weather, time of day, and any obstacles, such as construction or potholes, when cycling on any route within the County of Lanark. Certain of the roads and highways on this cycling map, including Highway #511, have high traffic volume and are used regularly by transport trucks. Cyclists should exercise the same level of caution whether riding on a route designated by this map or any non-designated route. The County of Lanark, Town of Perth, Perth & District Chamber of Commerce and others involved in the design and publication of this map and the cycling routes are not responsible for any loss or damage users may suffer as a result of using this cycling map or the cycling routes. 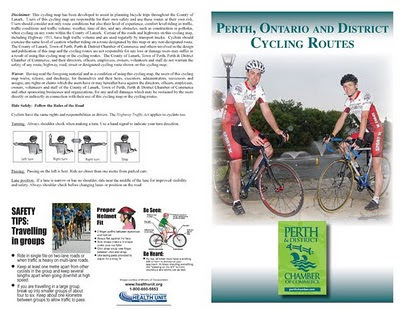 The County of Lanark, Town of Perth, Perth & District Chamber of Commerce, and their directors, officers, employees, owners, volunteers and staff do not warrant the safety of any route, highway, road, street or designated cycling route shown on this cycling map. Waiver: Having read the foregoing material and as a condition of using this cycling map, the users of this cycling map waive, release, and discharge, for themselves and their heirs, executors, administrators, successors and assigns, any rights or claims which the users have or may hereafter have against the directors, officers, employees, owners, volunteers and staff of the County of Lanark, Town of Perth, Perth & District Chamber of Commerce and other sponsoring businesses and organizations, for any and all damages which may be sustained by the users directly or indirectly in connection with their use of this cycling map or the cycling routes. Goodness me. Talking about overcomplicating a simple issue. I wonder if damages include paper cuts? Do motorists in Ontario have to sign waivers before acquiring road maps? Considering how many car accidents there are, you'd think they would need to/be forced to. "Turn left, 500 metres... at your own risk and releasing the company who produced this GPS machine from all liability..."
"Continue straight, 1 point 3 kilometres... fully accepting that you are doing so entirely at your own risk..."
"Though cycling is a common mean of transportation for the locals, it has become a favourite leisure activity these days. Abu Dhabi provides many bicycle lanes that go through the skilfully developed public parks, gardens and roads in the city." Which sounds lovely. Although on another site they were mentioning the Corniche, a boardwalk along the sea and highlighting that it was perfect for walking/promenading "although the more adventurous visitors could rent a bicycle and ride on the bikes lanes."